Double-acting wedge clamp for clamping dies on a press bed or slide or for clamping dies in injection molding machines. 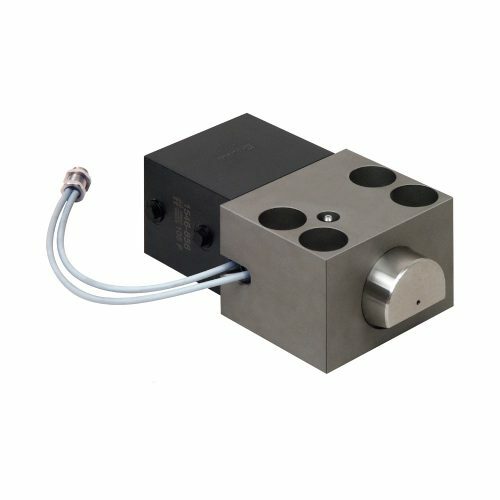 The wedge clamp consists of a hydraulic block cylinder and a piston guided in a housing. The clamping bolt is provided with 20¡ bevel to clamp on the tapered clamping surface of the die. Based on the internal design of the wedge clamp and the 20¡ clamping bevel the system is providing internal friction. For reasons of safety and in order to comply with the specifications of the ÔMachineryÕ directive no. ML98/37/EC, hydraulic pressure must always be maintained. When upper dies are clamped by wedge clamps, they must be secured mechanically when maintenance work is carried out. The inductive proximity switches are installed in the guide housing. They are activated by the clamping bolt. The contact areas are designed in such a way that one signal each is provided for the bolt in its initial position and in the clamping position. Resistant to temperatures of up to 100¡C, 120¡C for 1000 working hours. 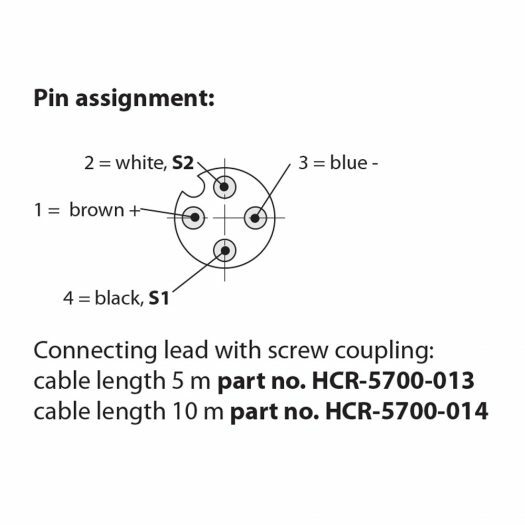 Cable length: 250 mm. 4-pole plug.